This is a guest post written by star teacher and RealLife English community member, Nabila Madani, from Algeria. Nabila, also known as “Nana,” shares her incredible lifelong journey with the language that changed her life! Learning English was the best experience of my life. I have been teaching it for nearly 5 years now, but my story with the English language is deeply rooted in my childhood. My journey with English started when I was just 6 years old. My family used to live next to a middle school, and my father worked there as an accountant. He used to take me with him to play with the kids there, but I was more interested in the classes than running on the playground. The school fascinated me. I wanted to attend the classes with the other kids so badly. The classes that attracted me the most were French and English. The only foreign language I knew at that time was French. My father was good at French and English as well, so I guess I inherited my passion for foreign languages from him. I still remember the first English class I attended at that school. It was about quantifiers and I was so amazed by this new language and how the teacher spoke it. When I look back in time, I realize that I have been studying English almost my whole life. I started officially learning it in middle school when I was just 11 years old. I was very good at it, as I passed all the tests with flying colours and without great effort. And when I wrote essays or short stories, the teacher used to read them out loud to the whole class and show them to all the teachers. I was very proud. I continued my studies at high school with the same energy and enthusiasm. Learning English, in my opinion, was a piece of cake! By the age of 18 it was time to go to college and choose a suitable major. Guess what I chose? Indeed, I enrolled in the English Department. I have always thought that English would be my window to the world, and that’s why I chose it. I didn’t care about what I was going to do with it when I graduated, which career I was going to have; all I wanted was to study and master this intriguing language that would lead me to explore the world. But guess what? I succeeded in obtaining a BA degree in English Literature and Civilization. English has not just been a language to me, it was also a way of thinking, a life style and a culture. When I first started learning it, I was very captivated by the native English speakers and their culture. I was so obssessed with their way of living, addressing people , music, clothes , food and all. I wasn’t quite satisfied with what I have learned at school. I learned about history, linguistics and literature. My ability of writing was very good, however when I used to listen to natives I could barely understand half of what have been said, and I couldn’t express myself as I should. I struggled every time I wanted to chat with friends or talk to my teachers. I knew I could do better. So I followed some techniques to improve my English such as watching TV serials and movies, mainly Americans, to see what is a typical native English speaker like, how do they pronounce words, and try to imitate them. In addition, listening to music, memorizing lyrics, try to find the meaning of the slangs and ideoms used and mimicking singers in front of my mirror were very useful for my fluency . Furthemore, I kept a diary to write what I have learned everyday and write about my life events. Playing word games was great for enlarging my vocabulary. As I was through that process, I became more and more interested in the different accents and cultures of English speaking countries. My curiosity grew bigger. 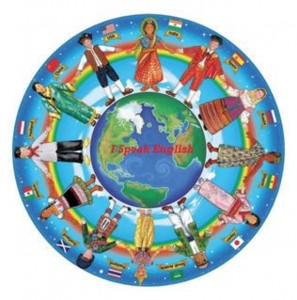 The desire to meet people from different part of the world, learn about their cultures, and let them learn about mine, discover our differences and what we have in common, to be able to communicate and find a way to make this world a better place for all human beings without prejudices and misunderstandings, became my goal. I had a strong belief that this will only be possible through English. Connecting online has granted me the opportunity to pave the way to my dream. I spoke with a lot of people over the past three years, exchanged ideas and learned a lot about the diversity of our world. We didn’t need perfect English to communicate. Being able to convey our thoughts was enough. Recently, I have discovered Real Life English Community. An amazing platform for people to connect, learn English in unconventional fun methods, learn about one another’s background, and plant the sense of world citizenship. In short, it represents an ideal microcosm of the world. It was just the perfect place I have been looking for. RLE has inspired me and motivated me enormously to keep on learning English, become more fluent, be more creative and update my teaching methods to help my students enjoy learning English as much as I do. My advice to all English learners, just relax and have fun learning English. Don’t be stressed and haste to become fluent and enjoy every moment of your learning process. Find people who share the same passion as you. Practise , practise and practise as much as you can. Let English be your visa to tour the world. If you enjoyed this post and would like to learn more about our wonderful international community, please join the RealLife English Global Movement. To learn more about RealLife English, be the first to find out about our best videos, articles, and even free presents, sign up for our mailing list. If you sign up now you get a FREE COPY of our popular e-book, 101 Words You Won’t Learn in School. This is an amazing article. I loved it. I overhear about Nana Kim from podcast and now I think about what is going on in her life is pretty interesting! I am, as an English learner, looking up to what she's done. Thanks for the awesome article, Justin. Great article Nana!! This is really inspiring for all language learners, congrats on your English! I am proud of you my life. ? Nana your are amazing, I like your story and your experience with learning english, (they call me nana by the way) I have been struggling in learning english for about 3 years but I m trying to learn english without school ,just me and the internet ,reading books watching tv and movies. So I m glad to hear your story and take tips from you. Thanks to real life english which give us lots of information and opportunity in a fun way!!!!! Happy to hear about nana it's a nice coincidence to have her here, my name is also Nabila and I come from Algeria too, it's a plaisure to read her interessting story with English, well done. I am an english learner as well and live in the UK, my goal is to improve my speaking English.Hope I can improve with RLE and become an effectif member in this community.